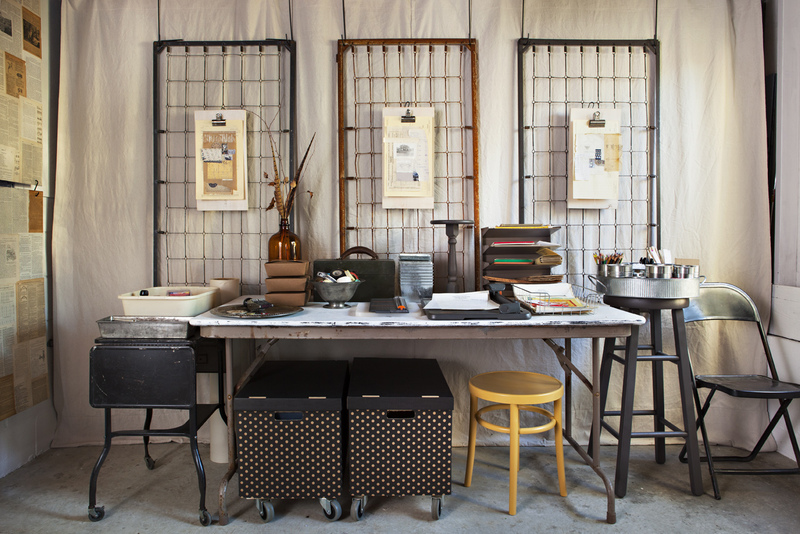 Refresh your workspace with these tips on organization, storage and style. When inspiration strikes, you want your desk top clean so that you can get straight to work. A crowded surface can slow you down or lead to misplaced items; find storage that helps you keep track of paperwork or supplies, maximize space and keep away the clutter. Storage and accessibility don’t have to conflict either, just keep the few essentials you’ll need close by, and hide the rest away in storage units. By prioritizing your supplies, you’ll find space for a few of your own personalized treasures to display too. Scroll to see our favorite workspaces, browse storage options and learn how and where to display office essentials and key pieces of decor. 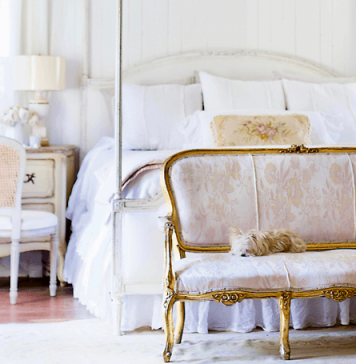 Can you figure out the secret to this bright cottage beauty? Extra lighting! Desk lamps are an affordable and easy fix for poor lighting, but if you have a larger workspace you may need more than one lamp. Instead, install overhead lighting to illuminate your entire workspace. Is your desk reserved for computer use or reading and relaxing? If you only use the space occasionally, a few sleek trays may be plenty of storage for your needs. Rather than crowding surface space with lots of décor pieces, let your beautiful desk speak for itself and pick just a few statement pieces that speak to you. Tip: Studies show that plants have a rejuvenating affect on the mind, so nurse some greenery or flowering plants to keep your mind focused and energized. This workspace is infused with personality thanks to color, pattern and upholstered seating that come together for a vibrant cottage garden theme. 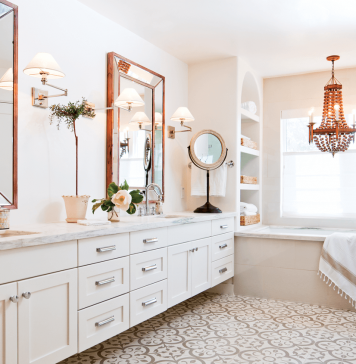 The trellis wallpaper adds a bit of chic style. Play with textures and patterns to bring life to your office spaces. But this space isn’t all looks; a desktop, lamp and television screen overhead supply office essentials. By positioning your heavy and non-mobile essentials off to the side or overhead, you won’t have to reorganize your desk space every time you need an open surface. Storing your documents and files digitally can help reduce clutter too. It’s cupboards galore in this kitchen turned workspace, leaving the spacious counters wide open. With storage units and a large surface area, you have more room to add functional appliances and decor pieces without adding clutter. 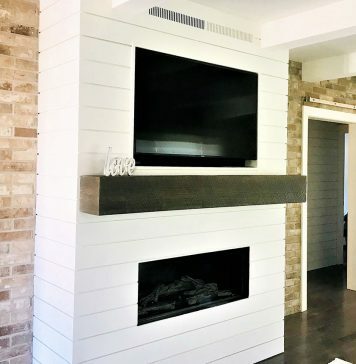 Some open shelves afford a spot to add some creative energy. Tip: If you need to store large appliances at your desk, like a printer, hide it inside of a cupboard to avoid a cramped workspace. If you’re and artist and need something a bit more creative for your setup, check this one out. Artist Amy Duncan www.fourcornersdesign.blogspot.com sets up an accessible and ready-to-work space with a wall mount in place to hang images for inspiration and a lots of vintage office sorters to add that retro inspiration. Vintage industrial trays and lunchboxes keep various supplies sorted. Amy also chose rolling storage on caster to make them easy to access and rearrange as needed. When you storage tools are easy to use, you’re more likely to use them consistently. By maximizing your wall space, your desk will remain clutter free, prepped and ready for your next DIY project. 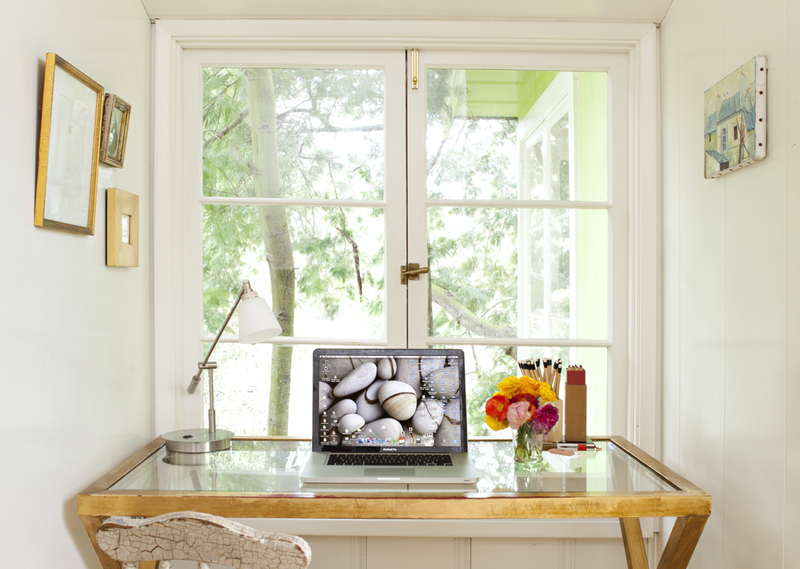 Stylist Jacqueline deMontravel chose this tiny nook as her home office because of the inspiring view. 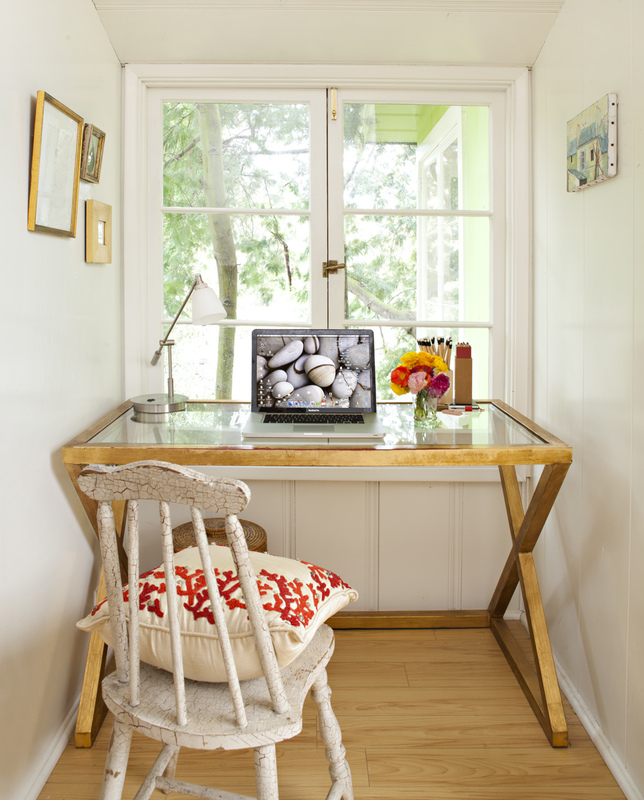 But to combat the tight squeeze, she chose a glass-top desk and paired it with a vintage spindle-back chair. This light-weight option allows the eye to see more making the space feel a little roomier. 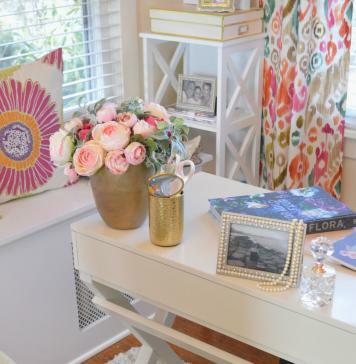 Bright fresh pattern and smart storage combine in this home office refresh. 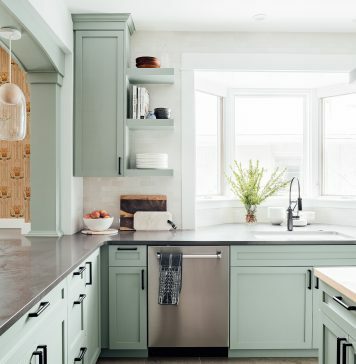 A 1912 kitchen artfully mixes diverse design styles.